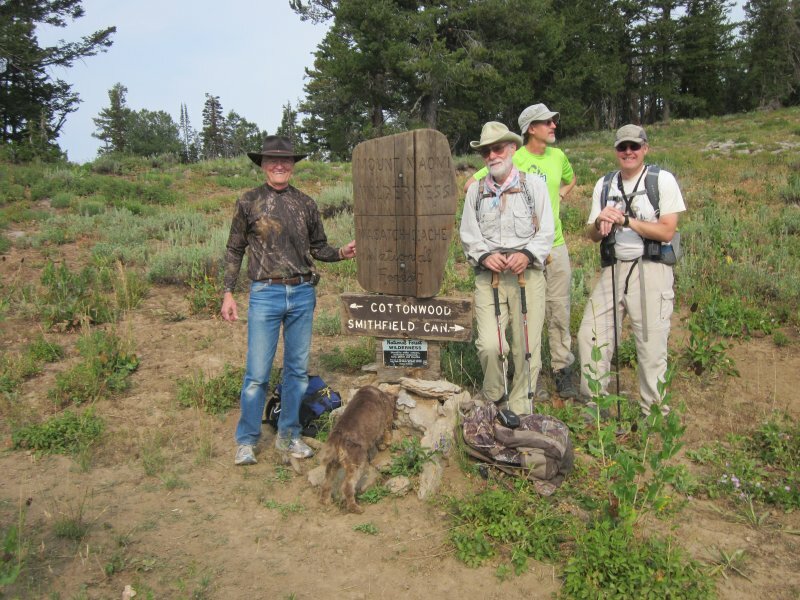 Dan led this exploratory hike from Tony Grove to Wood Camp, a long hike along a seldom used route with a lot of off-trail travel. Five hikers met at 7:30 A.M. in anticipation of a long day of hiking: Dan, Dave P., Dave W., Jim, and Bob with his dog Jaxx. We ended the day with six hikers, since Denis joined us mid-way. Two vehicles were positioned at Wood Camp for our return, and everyone piled into Jim's car for a ride to Tony Grove. Our hike started at 8:50 A.M. at the Backcountry Trailhead , on the Tony Grove to Green Canyon portion of the Mt. 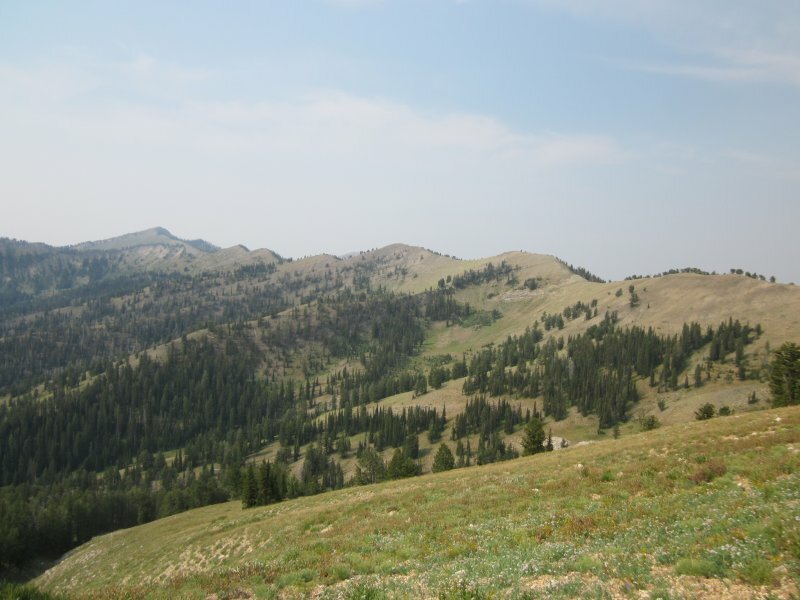 Naomi Peak National Recreation Trail (NRT). 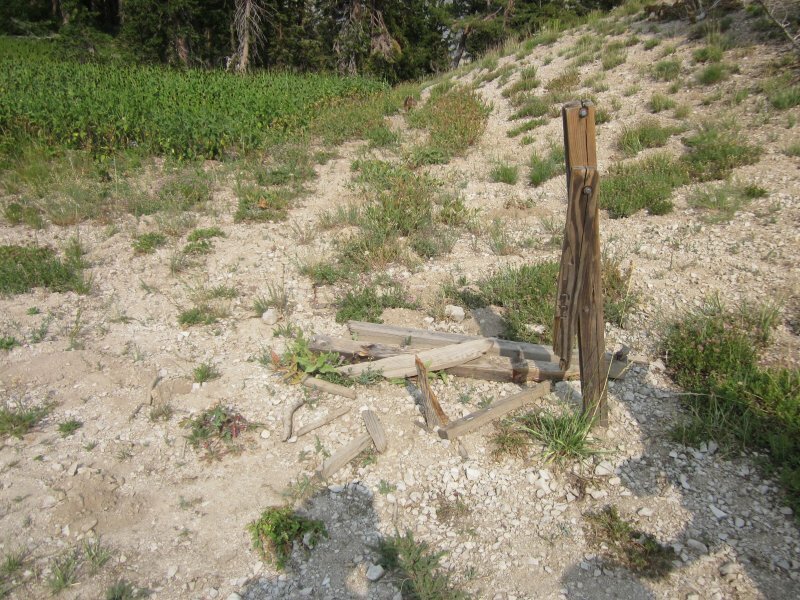 It was obvious that the trail crew had been busy since we traveled it a few weeks ago. New posts were in place, ready for new signs to be attached, and the many logs that previously blocked the trail had been cleared. We arrived at Coldwater Spring about in 50 minutes and the Wilderness boundary at 10:00. Here, we turned onto the Smithfield Canyon Trail and walked around the head of Cottonwood Canyon, arriving10:50 at a broken down sign at the head of Smithfield Canyon, 3.5 miles from the trailhead. At this point we left the maintained trail to travel south along the ridge crest toward Mt. Elmer along the "seven sisters" route (so named because of the many high points along the way, but we were able to follow a path that skirted many of the higher locations). One of our hikers spotted a small obsidian projectile point along this route, evidence of Native American hunting activity in the past. We flushed a number of grouse along this section, so maybe that ancient archer was hunting these birds. After a lunch stop on the ridge, we hiked to the spot where the Mt. Naomi Peak NRT comes up from Cottonwood Canyon - and we met Denis! He missed us at our Logan meeting spot, drove to Tony Grove, and hiked like crazy to join us for the rest of the trip. Jim and Dave P. decided to leave the group and return to Tony Grove via the Mt. Naomi Peak NRT so they could drive our cars back to Wood Camp, avoiding the need for a long car shuttle at the end of the hike. 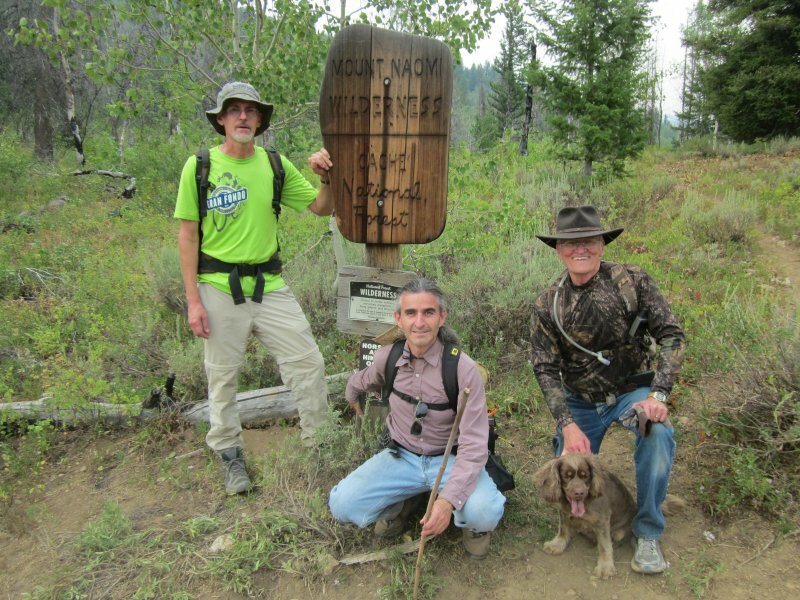 The remaining hikers (Denis, Dave W., Dan, Bob and his dog) headed down the South Fork of Cottonwood Canyon. We followed an old stock trail part of the way, but the old trail disappeared and we had to "bushwhack" through thick vegetation and steep side slopes for a mile before we got back on the old trail. The old stock trail eventually led us to the Cottonwood Trail at 5:15, 9.4 miles from our starting point. From here, it was a relatively easy hike to the south over (mostly) well-maintained trail, past the Wilderness boundary and out the Old Juniper Trail to the Wood Camp Trail Head and our vehicles, at 7:10 P.M. Dave P. and Jim were waiting for us here, and we all were able to enjoy a good drink of ice water before heading back to town. This was a strenuous and a long day of hiking, as anticipated. It took us almost 10.5 hours to travel the 13.7 mile route, with 2800 feet of climbing and 5400 feet descending. Almost half of the total distance was off of maintained trails, making for slow and difficult travel. We decided it would be a good idea to avoid this route in the future! The Wilderness boundary, 2.2 miles into the hike. Our route followed the crest of the "seven sisters" ridge, almost to Mt. Elmer, the high point in the distance. Broken sign at the top of Smithfield Canyon. 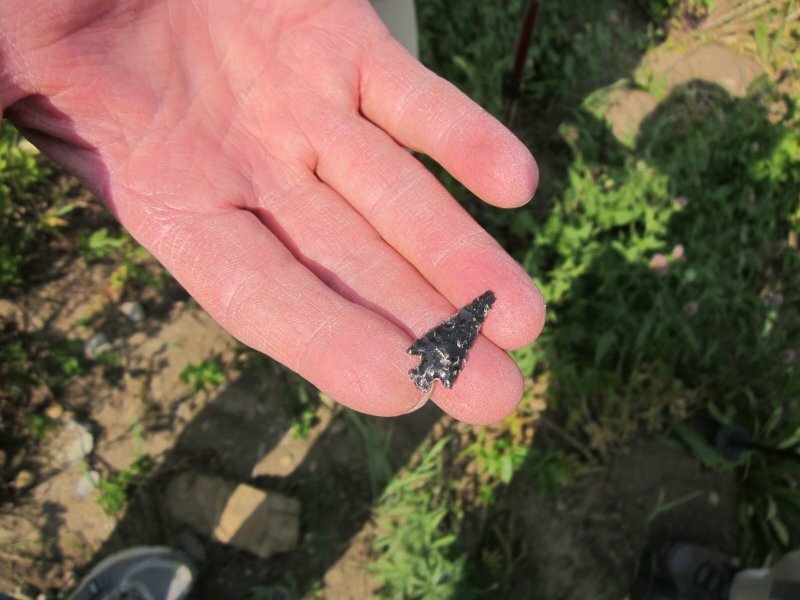 We spotted this obsidian projectile point along the way, evidence of Native American hunters. 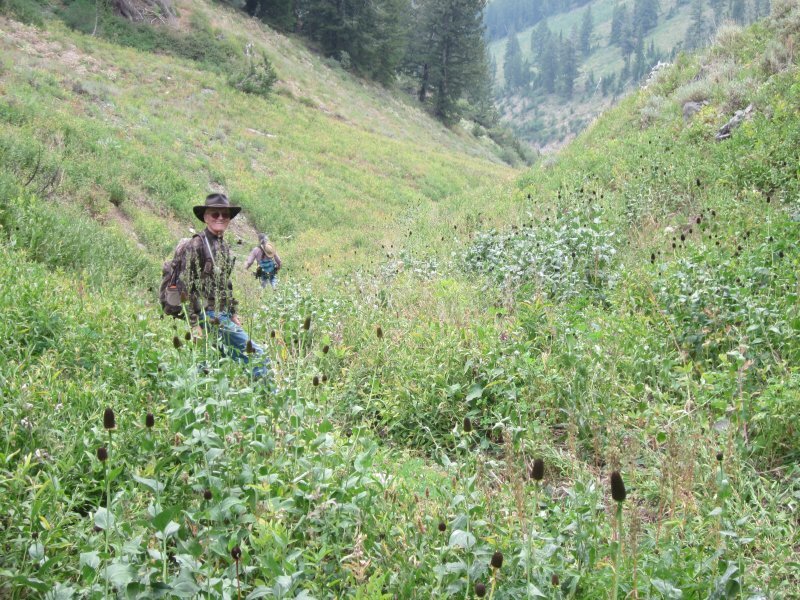 "Bushwhacking" off-trail, down the South Fork of Cottonwood Canyon. Leaving the Wilderness, 10.3 miles from the start of our hike - and still smiling! The GPS track of our trip shows 13.7 miles total distance, with 2800 feet of climbing and 5400 feet of descent.